In honor of the young prospect's recent call-up, the Topps Store is offering an exclusive 2015 Topps Carlos Correa 2013 Bowman Acrylic Wall Art collectibles. Thanks to a metal wall mount, the 10" by 14" wall hanging appears to hover and is available in a variety of parallels. 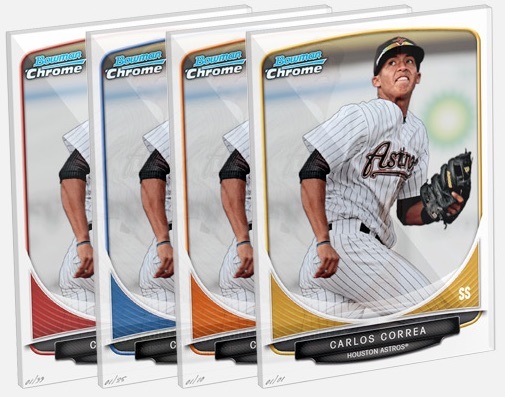 Collectors have four total choices among the 2015 Topps Carlos Correa 2013 Bowman Acrylic Wall Art pieces. The options are each hand-numbered to 99 or less and the price increases as the print run decreases. The prints feature 1/4" acrylic plastic stock. Although just into his twenties, the hobby is already well aware of the Puerto Rican shortstop and there are quite a few Carlos Correa prospects cards to chase. 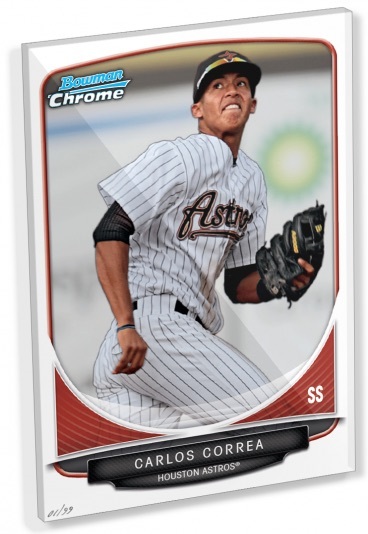 The 2015 Topps Carlos Correa 2013 Bowman Acrylic Wall Art actually pays homage to one of his most popular prospect cards. Topps Wall Art Poster Bronx Belters, Judge Sanchez Gold. Hand # 1 1. 10”X 14”.